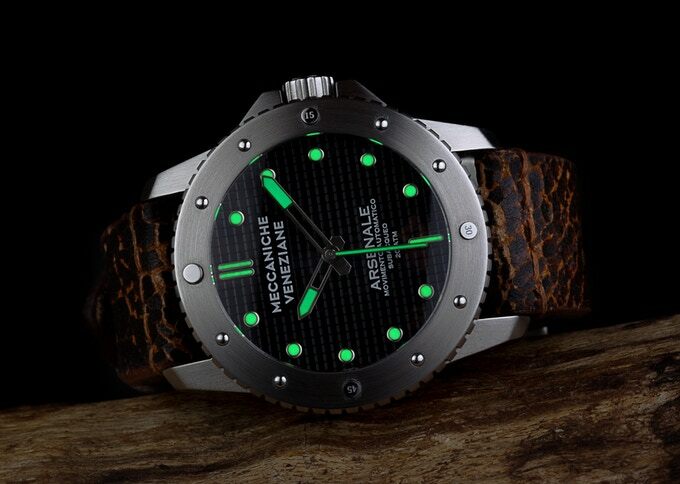 In advance of the last warm weekend I present a pretty cool crowdfunded watch that might be worth a look. Called the Arsenale Automatic it pays tribute to Venice’s proud sailing history and looks just brutish enough to remind us of her violent, pestilence-filled past. The watch comes with a Miyota or ETA movement – either Japanese or Swiss – and comes in a brush polished steel or aged PVD. The bezel rivets – with numerals at noon, three, six, and nine – are reminiscent of another Italian brand, Panerai, but they’re supposed to represent porthole rivets. The watch will cost about $600 retail. For now you can get it on the crowdfunding page for $338. Why is this special? It’s rare to find a crowdfunded watch with the right balance of features. This one is particularly interesting because of the heritage – I’ve never seen a Venetian watch – and the design. It might not be as fancy as an Omega or a Breitling but for less than $400 for a nice three-hander you could do worse.